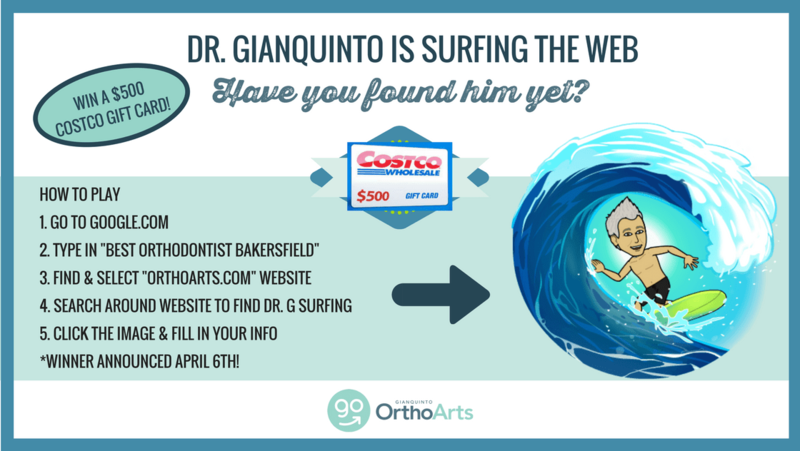 Find Dr. G Surfing the Web WIN a $500 Costco Gift Card! At Gianquinto OrthoArts, we love making people smile and are always looking for better ways to do just that. We’ve completely redesigned our website to showcase the OrthoArts experience, and we’re pretty excited about it! To celebrate, we’re offering the chance at a $500 Costco Gift Card for anyone who wants to join in on our Surf Search Contest! When you find it, click on it, and enter your information! The lucky winner will be announced on the @OrthoArts Facebook and Instagram pages on April 6th.